With temperature expected to stay above freezing this weekend, the rate of snowmelt in the Kennebec River watershed could cause flooding early next week. Two storms expected next week, combined with warmer weather at the end of this week, could bring flooding to central Maine. Derek Schroeter, a meteorologist with the National Weather Service in Gray, said two “rather impressive rain events” are expected next week. But even before the first arrives Sunday night, higher temperature will move into the region. The rain, he said, is expected to start after early Monday morning and continue through Tuesday morning. An area of low pressure over the Gulf Coast of Texas will move northeast up the Ohio River Valley. Schroeter said as of Thursday, the center of the low is expected to be on top of Maine by about 10 p.m., Monday. As the storm pulls away, wind will pick up Tuesday. A second storm is expected to move through the region at the end of next week. The snowpack in a region stretching from the White Mountains of New Hampshire into western Maine is 40 to 50 inches deep, he said. The Kennebec River watershed covers about 6,000 square miles, from the Moosehead Lake region down to Merrymeeting Bay, south of Richmond. Its tributaries include the Sebasticook, Carrabassett and Sandy rivers. Kennebec County Emergency Management Agency Director Sean Goodwin said those conditions could result in minor to moderate river flooding. Most of the rivers and streams in the watershed are now free from ice, so ice dams are not a concern. “The Flood of ’87 was not caused by ice,” he said. That flood, which was the largest flood in the state’s history, resulted from heavy rain over the region accompanied by a melting of the snowpack. The swollen rivers destroyed dams and bridges and swept away buildings along their banks. 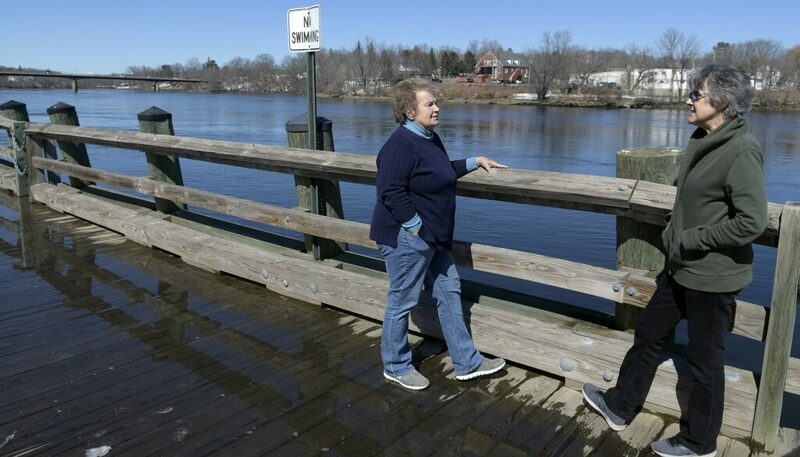 In southern Kennebec County, the Kennebec River flowed into low-lying areas in Augusta, Hallowell and Gardiner, prompting a disaster declaration here as well as in 13 other counties.